Hi all, it's TqTninja (yeh my user name says yoshimitsu_tqt. But its the TqT and ninja part that counts! i'v had this account since i dunno when but hav never used it much. anyway just thought i'd post something cos i think this is my first post ever! trying to create the number 1 facebook page for Yoshimitsu and overtake some italian yoshimitsu page described as "drugs". seriously, no honor >:( like it now! 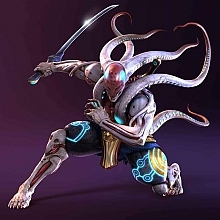 also i should use Manjikai more, because its the main source of yoshimitsu content! Oh and a little about me as a yoshimitsu fan and player. Silver_shinobi in tekken 5 and TqTninja in tekken 6/BR and ttt2. Formerly [ i ]Slash! I'll also gladly support your fb page. Hello! :D It's nice to see another member. OMG, I just realized you're yoshimitsutqt from DeviantART!!! I love your Yoshimitsu fan art! It's so awesome! # Aozame32 : OMG, I just realized you're yoshimitsutqt from DeviantART!!! oh yeh i recognize ur username from deviant art too! thanks yo ^^ such a small world! Loved the artwork on your deviantart. Do you take requests? I gotta tell you, man, that awesome image you created of the Kagekiyo mask using Photoshop...? I have it tattooed on my back. The historical figure Taira no Kagekiyo means a lot to me, and Yoshimitsu is my role model, so something that represents the both of them so beautifully was definitely worth all of the pain. tqt: Yeah if you'd be willing, I have a few tattoo ideas in mind. I basically have a handfull of samurai pics and looking for someone willing to sketch something out for me using their imagination (with some pointers, of course). # Aozame32 : I gotta tell you, man, that awesome image you created of the Kagekiyo mask using Photoshop...? I have it tattooed on my back.